Founded by a lady from the UK, The Earth Trust currently supports around 50 small scale organic & biodynamic producers in Tamil Nadu. The organisation finds markets for produce & guarantees a good price to the farmer. They also offer training in organic & biodynamic farming. This offers a route out for many small scale Indian farmers who are trapped in contracts with multi nationals. The farmers become reliant on buying their seed & chemicals each year from the multinationals, leading to soil degradation, environmental damage & a loss of ownership over what they grow & how they choose to farm. 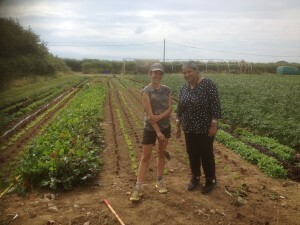 Nimmi came for the afternoon and enjoyed herself so much, she cancelled her trip to Cardiff the following day, spent the evening on the beach with us, stayed overnight & spent another day harvesting & meeting members & volunteers at Cae Tan. Nimmi told us some great stories about the Nilgiri Hills. They have a diverse climatic range, growing coffee & pepper in the lower lands & more UK type veg in the higher hills. Whilst we contend with slugs & snails, they have herds of bison, troops of monkeys & families of wild boar rampaging through their gardens. We discussed how we may link to The Earth Trust, possibly through a youth programme linking to children involved at Cae Tan to young people in their communities. We’ll likely make a visit there to see how we can get involved! !